Another regular feature is Churchyard Mornings, held once a month on Saturdays throughout the summer months. It is not unusual to find 10 or 12 people busy keeping the churchyard tidy. Why not come along and join us? There's coffee and chat as well!! Supplemented by contractors who undertake the mowing of the “active” part of the churchyard, we have a churchyard to be proud of, and which, with its stunning views across the Thames valley, brings peace and solace to those who visit it. 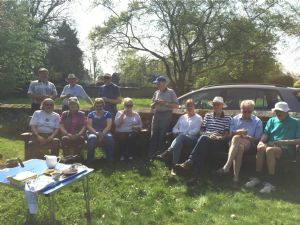 The next Churchyard Morning will be on Saturday 13th April and Friday 26th April.